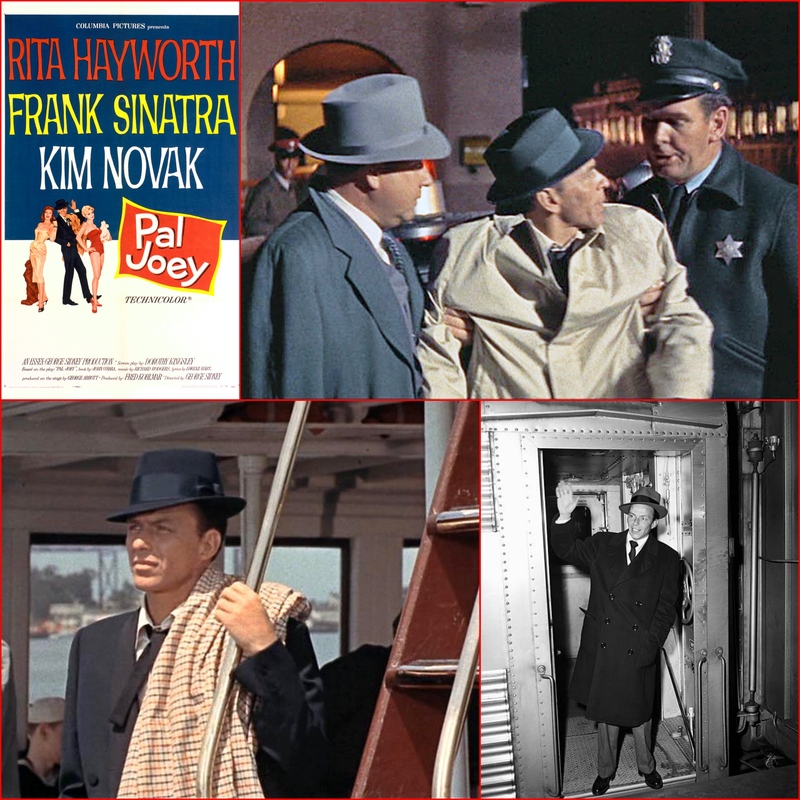 In the 1957 musical film Pal Joey, Frank Sinatra gets off a Southern Pacific train and then heads across the bay to San Francisco aboard one of the SP Ferry Boats. Oakland Long Wharf was the western terminus of the Southern Pacific Railroad. 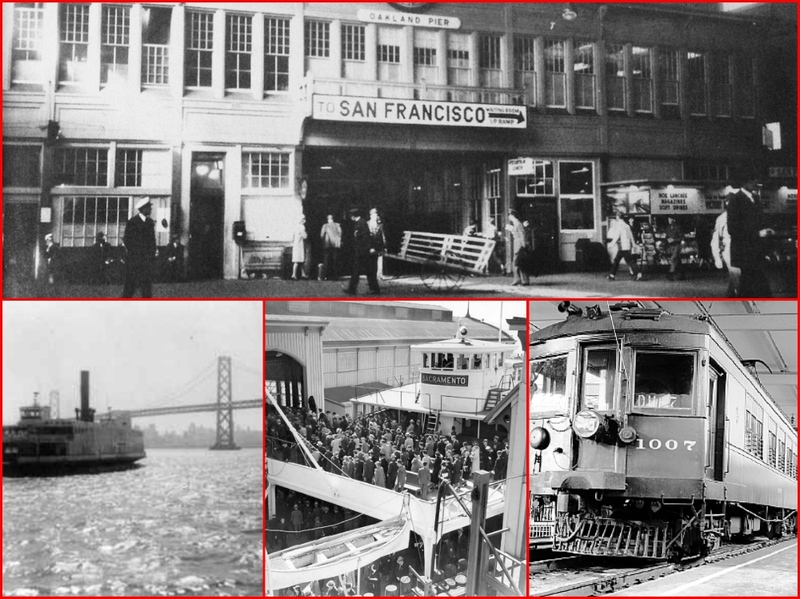 From there, ferries carried both commuters and long-distance passengers between the Long Wharf and San Francisco. 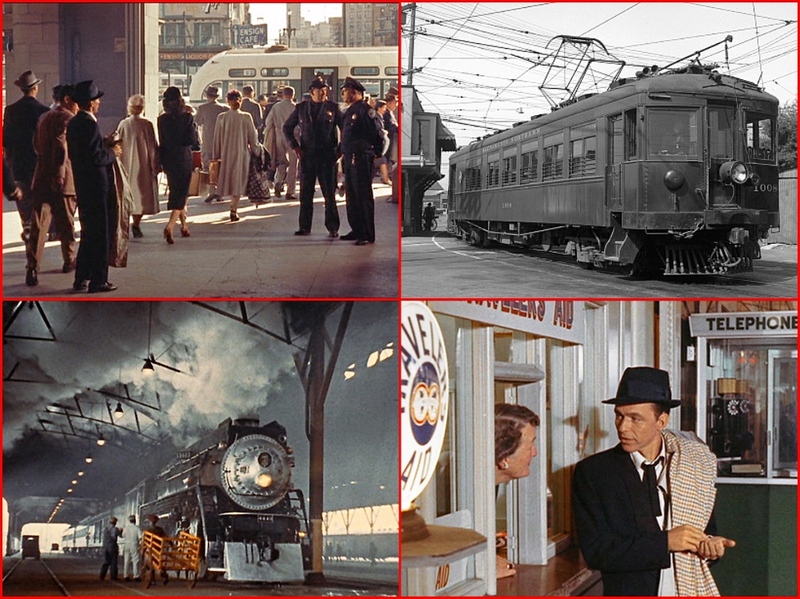 Scenes from PAL JOEY: Clockwise: Arrival in San Francisco; Commuter streetcar; Frank Sinatra; Local Train. Part of the wharf was filled in between 1879 and 1882, creating a mole. Local commuter trains also used the pier, while trains of the Pacific Railroad (aka the “First Transcontinental Railroad”) used another wharf in nearby Alameda for about two months in 1869 (September 6 – November 7) after which the Oakland Long Wharf became the western terminus of the Pacific Railroad as well. The Central Pacific’s operations were consolidated under the Southern Pacific in the 1880s, and in 1882 the Oakland Pier was opened about a half-mile east of the west end of the Long Wharf which was then used only for freight until being abandoned in 1919. After January 15, 1939, electric commuter trains no longer ran to the Oakland Pier but instead used tracks on the San Francisco-Oakland Bay Bridge to the Transbay Terminal in San Francisco. 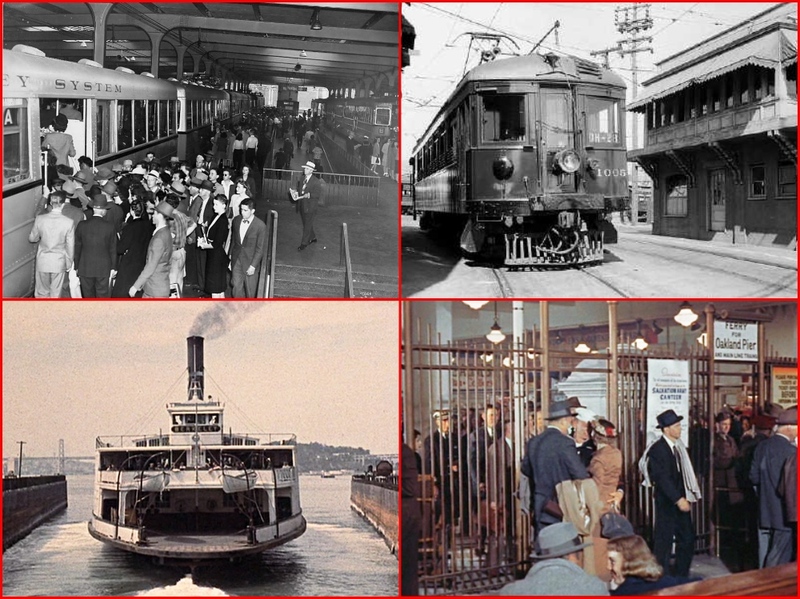 Intercity passenger trains continued to run to Oakland Pier until 1958 when Southern Pacific ferry service from the Ferry Building in San Francisco to Oakland Pier was discontinued, replaced by buses over the Bay Bridge from Oakland’s 16th Street Station. Ferry approaches San Francisco in 1941. The recently completed San Francisco-Oakland Bay Bridge is in the foreground. The ferry is carrying passengers who have just arrived from Chicago and New York. Throughout the pier’s existence, progressively greater portions of the Bayshore tidelands were filled in. It was demolished in the 1960s to make way for an expansion of the burgeoning Port of Oakland’s container ship facilities. Today, the only thing that remains of the SP Mole is the pier’s switchman’s tower which was moved and restored as part of Middle Harbor Shoreline Park. 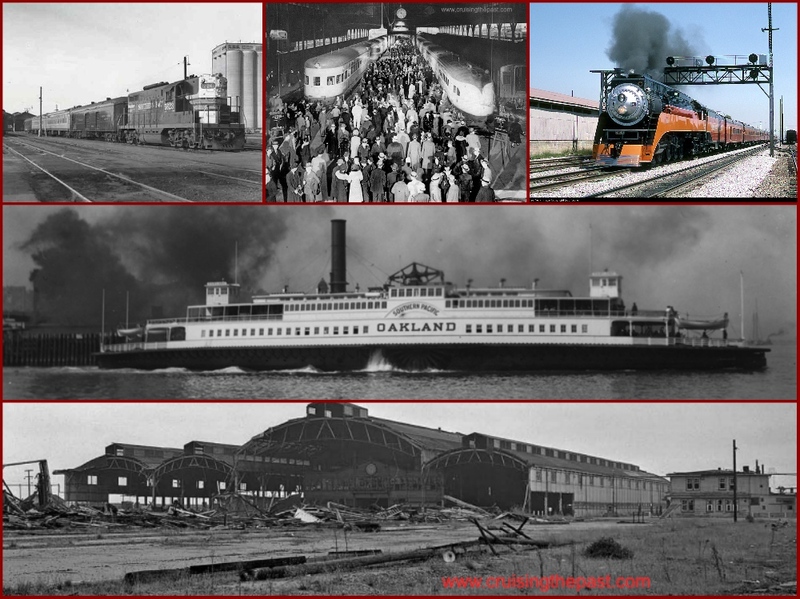 Over a 24-hour period in 1920, Oakland Pier handled an average of 763 mainline and suburban passenger trains. 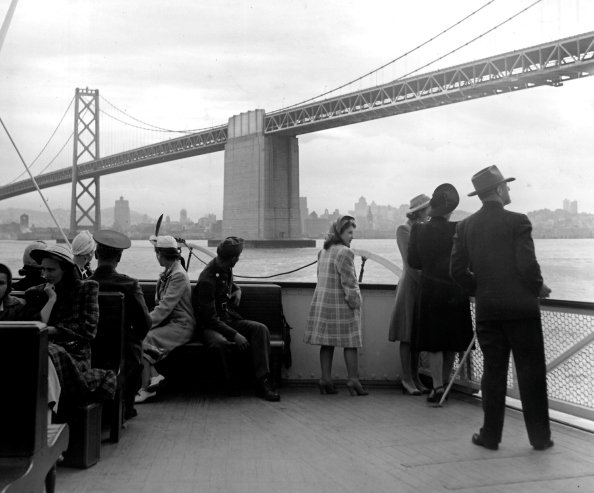 56,000 passengers used the connecting ferry service operating between San Francisco and Oakland Pier. The delightful eighteen-minute trip across the bay, with its invigorating ocean breeze, was also a welcome climax to a cross-continent journey. 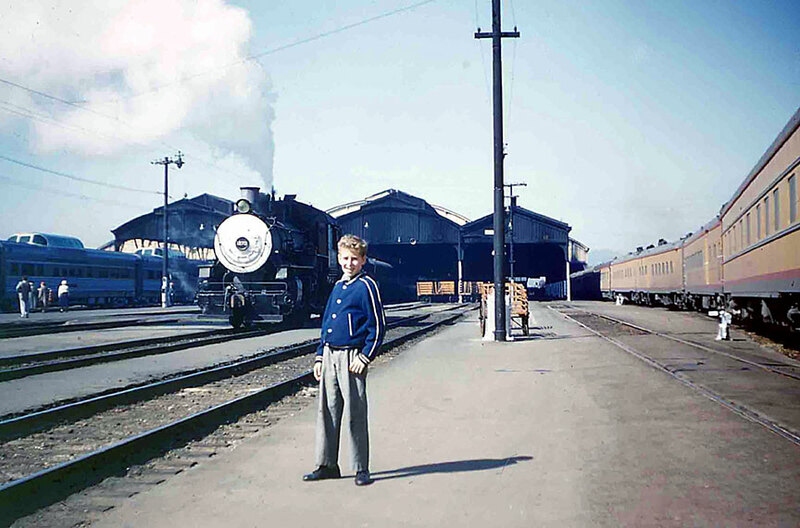 Michael Grace ready to board the California Zephyr in 1957. The CZ at the left boarding and the City of San Francisco arriving at the right The Oakland Mole. All this, combined with the tremendous flow of baggage, mail, and express, qualified Oakland Pier as one of the busiest terminals in the United States. The Santa Fe trains operated from Santa Fe Junction near Richmond, a distance of 10.6 miles, and their equipment, both cars, and locomotives were taken care of in SP’s West Oakland yard. This arrangement placed quite an additional burden on Oakland Pier terminal as well as the West Oakland roundhouse and passenger yards. In addition, 3500 pieces of baggage, 7000 bags of mail and 100,000 pieces of express matter passed through the terminal every day. 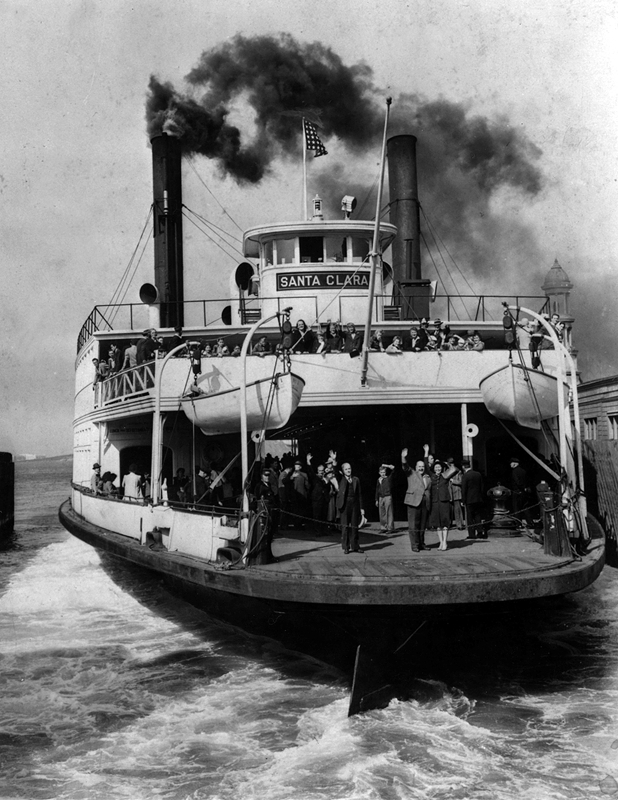 The ferry service between San Francisco and Oakland Pier at eighteen to twenty-minute intervals was also an important feature of the vast suburban traffic that moved between the East and West Bay districts. The record number of passengers carried over this route in a twenty-four hour period at the time was 195,000. Day after day, a steady parade of trains departed Oakland Pier for destinations north, east and south of the city. 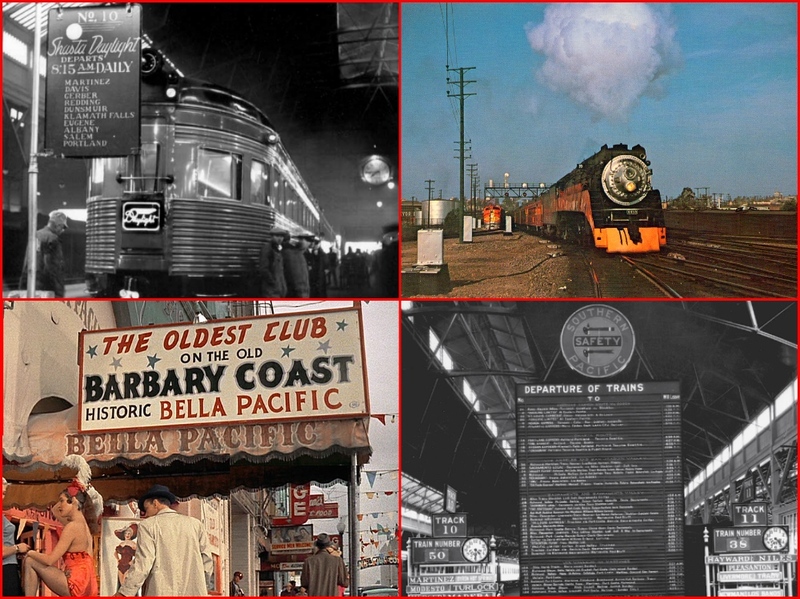 Not only was Oakland Pier a focus of Southern Pacific passenger operations on the Shasta, Overland and San Joaquin routes, but it was also the nerve center of the Western Division itself. In the offices at the head of the pier, and elsewhere in the complex, were the train dispatchers, crew dispatchers, division engineering and division officers, including train-masters and the superintendent. Action in Oakland Pier terminal yard in the 1950s was intense. 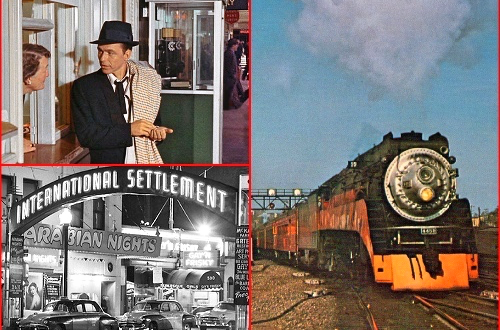 The near-constant hustle and bustle of terminal switch engines–be they steam or diesel–was punctuated by the arrival or departure of a passenger train from Portland, a commuter train from Sacramento, or a mail and express train from Ogden. All good things have to come to an end, and the great Oakland Pier terminal was not immune to various services being closed down. 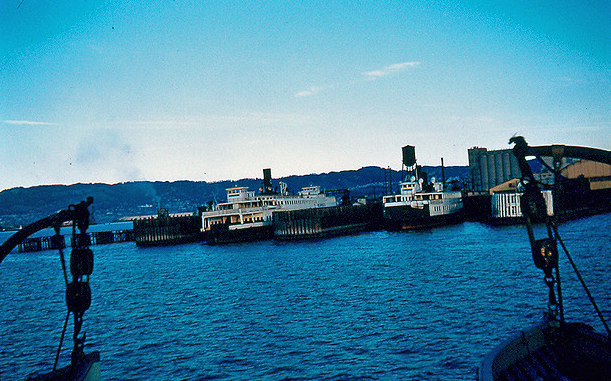 The last ferryboat to San Francisco, the “San Leandro”, operated on July 29, 1958. The last trains to use the Mole were # 19 and # 20, the “Klamath”, Shasta Route mail trains, in 1960.